343 - 3/22 to Buer, Gr, 344 - 3/23 to Gladbeck, Gr, 348 - 3/30 to Bremen, Gr. 2Lt Arthur R. Nicolaisen (P) - Mission 343 flown as CoPilot with a combat orientation Pilot 2Lt Everett H. Thornton. 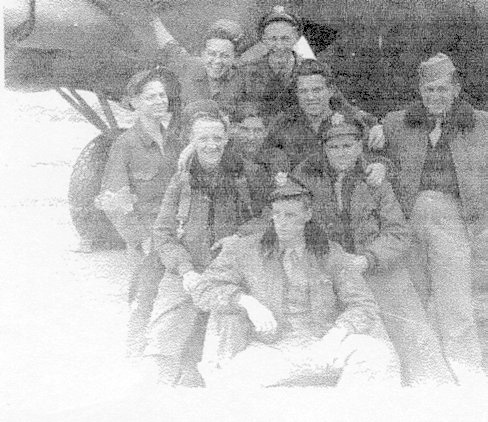 Other missions flown as First Pilot: Two missions as a combat orientation Pilot with members of the 2Lt Ernest A. Bailey Crew (356, 357); Other missions flown with his own crew. F/O Jack Silver (CP) - Assigned to 358BS on 15 Feb 1945 as CoPilot on the 2Lt Loren W. Bohle Crew. Flew 6 missions with the 2Lt Nicolaisen Crew (353, 354, 359, 360, 362, 363). Stood down on missions 356 & 357. Flew 10 missions with other Pilots: Lead Crew Tail Gunner/Observer (4 missions - 338, 340, 347, 352); As CoPilot - With 2Lt Loren W. Bohle (2 missions - 327, 328), With 2Lt Rudolph L. Griffith (4 missions - 339, 348, 351, 355), With other Pilots ( 2 missions - 325, 346). See Lead Crew photos - missions 340 & 352. Substitute CoPilots used on seven 2Lt Nicolaisen Crew missions: F/O Herbert Rush (4 missions - 344, 348, 351, 352); 2Lt Ernest A. Bailey (2 missions - 356, 357); 2Lt Glen A. Tableman (1 mission - 358). F/O Rufus E. Wilson (N) - Flew on ten missions with the 2Lt Nicolaisen Crew (343, 344, 348, 351, 352, 358, 359, 360, 362, 363) and one mission with another Pilot (350). Stood down on missions 356 and 357. Substitute Navigators used on four missions: Crew Bombardier, F/O Benjamin H. Wilson, Jr. (2 missions -353, 354); 2Lt Fred D. Dornblaser (2 missions - 356, 357). 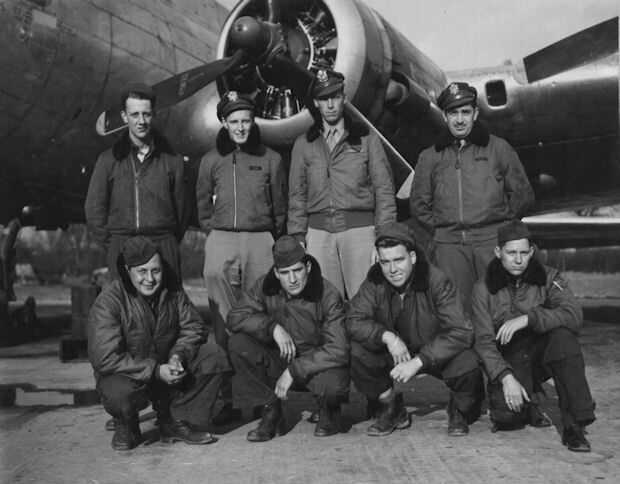 F/O Benjamin H. Wilson (B) Flew on one mission as crew Bombardier (343) and two missions as crew Navigator (353, 354). Stood down on missions 356 and 357. Flew on seven missions as Bombardier with other Pilots (344, 350, 351, 355, 359, 363, 364). Substitute Toggliers used on thirteen missions: Sgt George B. Novakovich (WG) as Togglier (9 missions - 351, 352, 353, 354, 358, 359, 360, 362, 363); Other Toggliers (4 missions - 344, 348, 356, 357). Sgt Robert L. Bentley (E), Sgt Robert C. Straub (BTG), Sgt Robert J. Gray (TG). Flew on twelve of the 2Lt Nicolaisen missions. Stood down on missions 356 and 357. 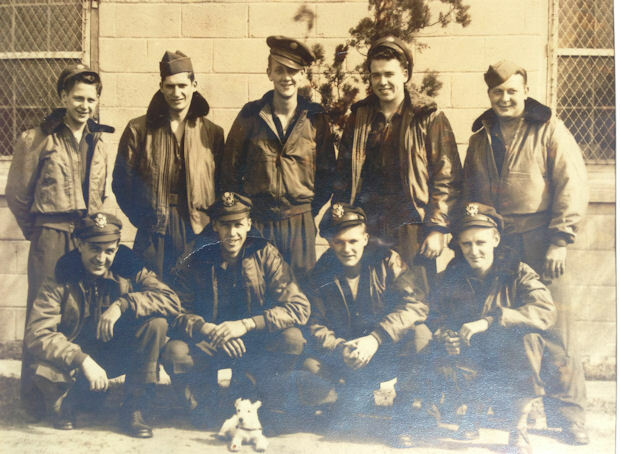 Sgt Ted F. Wierzbicki (R) - Flew on eleven of the 1Lt Nicolaisen missions (All except 344, 356, 357). Stood down on missions 356 and 357. Sgt George B. Novakovich (WG/TOG) - Flew on two 2Lt Nicolaisen missions as Waist Gunner (343, 344) Crew was reduced from 9 to 8 men with elimination of the Waist Gunner position. Sgt Novakovich became the crew's Togglier and flew on 9 crew missions as Togglier (351, 352, 353, 354, 358, 359, 360, 362, 363). Stood down on missions 356 and 357. Voice Interpreters (VI) - Flew with the 2Lt Nicolaisen crew on two missions (343 and 353).